Photo right: Pastor Wesley Pepper lead a prayer with the youth. Cooper's Chapel Church: A United Methodist Congregation of Quitman has had an eventful summer, beginning with Vacation Bible School kicking off July 10 with Cave Quest. 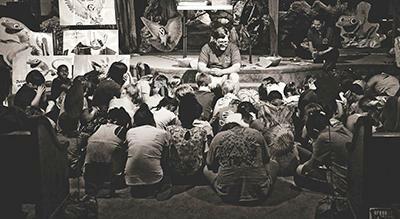 Averaging 75-100 kids every night, there were 25 professions of faith during the course of the week. Each night, offerings were made by VBS attendees to help fund the packing of meals for Stop Hunger Now in August. We are so appreciative of our volunteers who help make VBS a reality and bring the message of Christ to children who may not otherwise hear it -- from the teachers and teenagers who help teach the classes to the kitchen staff who makes serving dinner and cleanup go smoothly. Stop Hunger Now was held on August 14 in the Cooper's Chapel Fellowship Hall. Little by little, with change from our children and generous donations, we were able to raise enough money to pack 15,768 meals at $.29 per meal. We had over 100 volunteers help pack meals, weigh, seal, and box meals to feed hungry families wherever the need is greatest. Approximately 795 million people in the world are chronically malnourished. One in every nine people on our planet go to bed hungry each night. Stop Hunger Now gets food and life-saving aid to the world's most vulnerable people, and works to end global hunger in our lifetime. Established in 1998, they have provided over 225 million meals in 74 countries. Stop Hunger Now is based in Raleigh, N.C., and operates throughout the U.S. and through affiliates in developing countries. If your congregation would like to host an event, go to http://www.stophungernow.org/host-meal-packaging-event. Cooper's Chapel is also currently collecting cleaning buckets to help in the devastation following the historic floods in Louisiana through UMCOR, United Methodist Committee on Relief, which provides humanitarian and disaster response in the United States and internationally. At present, the congregation has provided 22 buckets, with more expected in the coming days. UMCOR also provides birthing, health and school kits to help sustain everyday life for people who lack ready access to essential supplies. For more information on flood cleaning buckets, go to http://www.umcor.org/UMCOR/Relief-Supplies for information on supplies, assembly, and transport of relief buckets. Cooper's Chapel is blessed to have so many in our congregation who are willing to give their time, money, and talents to help spread God's love. Cooper’s Chapel UMC is a part of the vital congregations committee (VCC). The VCC is a discernment body that ensures the ongoing effec­tiveness and oneness of annual conference churches, ministries and committees. The extended cabinet nominates the membership which is comprised of nine churches (each represented by a pas­tor and a member).